Frozen prepared foods have a bad reputation, and for good reason. Many of them are loaded with unhealthy ingredients that should be avoided. However, there are some TV dinners that you can enjoy when you’re too busy to make a meal at home and you don’t have a lot of time. Check out the top 10 healthiest TV dinners below, especially if you want to lose weight. This is one of the healthiest TV dinners because it contains just 320 calories, 4 grams of sugar, and 1 gram of saturated fat. Plus, it’s low in sodium, and it has 10 grams of protein and 8 grams of fiber. Ingredients include veggies, tofu, and black beans with a spicy sauce and corn tortillas. In the mood for something a little more exotic? Check out Saffron Road’s Chana Saag with Cumin Rice, featuring chickpeas and spinach over basmati rice. This meal contains 9 grams of protein and 6 grams of fiber, and it’s just 360 calories. 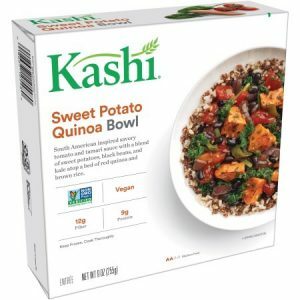 You can’t go wrong with Kashi’s Sweet Potato Quinoa Bowl, featuring tomatoes, poblano peppers, black beans, quinoa, and roasted sweet potatoes, totaling 9 grams of protein. All of this flavor and just 300 calories! Trying to cut back on your meat intake? Check out Gardenburger’s meatless chicken with rice and green beans. If you’re trying to lose weight, this is a filling meal that only contains 2 grams of fat and 220 calories. Lean Cuisine’s Salmon with Basil has just 260 calories and 8 grams of fat, making it a great choice for weight loss. With just 300 calories, you can indulge in some Italian food for dinner without feeling guilty when you have Celentano’s Roasted Vegetable Lasagna. When you’re pressed for time, reach for Smart Ones Rigatoni with Broccoli and Chicken, as it contains only 290 calories and 8 grams of fat. Yet another great option for a fast and easy dinner is Healthy Choice Mushroom Roasted Beef, with only 280 calories and 8 grams of fat. Another great choice from Amy’s is their Tofu Scramble, allowing you to have breakfast for dinner. In addition to tofu scramble, you also get a side of yummy organic veggies and hash browns. This meal has 4 grams of fiber, a whopping 22 grams of protein, and just 320 calories. Luvo’s Chicken and Harissa Chickpeas is another good choice, as it contains chicken breast, butternut squash, spicy chickpeas, and some kale. This meal has 19 grams of protein, 1.5 grams of saturated fat, and 310 calories. With the healthiest TV dinners in your refrigerator, you can rest assured that you’ll have something quick and easy to prepare on those evenings when you simply don’t have time to make a meal from scratch.